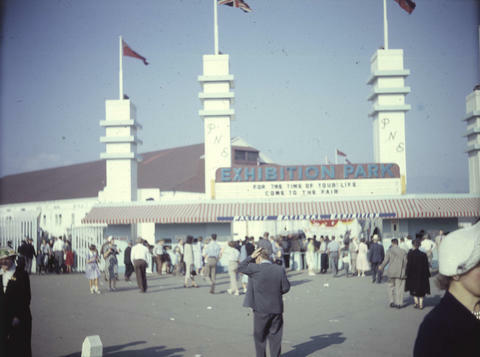 Item: CVA 72-15 - Exhibition Park, entrance to the P.N.E. Item : CVA 72-15 - Exhibition Park, entrance to the P.N.E. Exhibition Park, entrance to the P.N.E. Donated by W. Young in January, 1974. Access to original colour transparency is restricted for preservation purposes. Please use digital version. Transparency was originally sandwiched between a silver mat between two pieces of glass with either tape or a metal slide mount around the edges, and has been removed for preservation purposes. Samples of mounts preserved. Copyright: owner unknown; expiry: not determined. Insufficient information to determine copyright status.